The German Association for Water, Wastewater, and Waste (DWA) and the United Nations University Institute for the Integrated Management of Material Fluxes and of Resources (UNU-FLORES) signed a Cooperation Agreement to strengthen collaborative knowledge mobilisation and capacity development activities. Dresden, June 2017. – At the Dresden Nexus Conference 2017 in May, DWA and UNU-FLORES celebrated the signing of a Cooperation Agreement solidifying the close partnership between the institutes in several areas. The parties aim to strengthen their collaboration with regard to knowledge production, knowledge transfer, capacity development, and training activities. DWA and UNU-FLORES share, in particular, a common interest in the advancement of research and capacity development concerning the safe use of wastewater in agriculture, sustainable wastewater management systems, and the implementation, monitoring, and evaluation of water-related strategies to achieve the Sustainable Development Goals in Germany and abroad. Collaboration among the parties already spans a variety of contributions to important respective events such as the contribution of DWA to the UNU-FLORES co-organised scientific and capacity development workshop on the Safe Use of Wastewater in Agriculture (SUWA) with the Islamic Republic of Iran. With the signing of this agreement, it is the parties’ aim to expand their mutual activities to include new joint research projects. Furthermore, the institutes have agreed to promote the exchange of scientific and technical information and to jointly organise or participate mutually in workshops and conferences. In the first of such activities, UNU-FLORES and DWA will co-convene a session at the upcoming World Water Week 2017 and IFAT2018 in Munich. 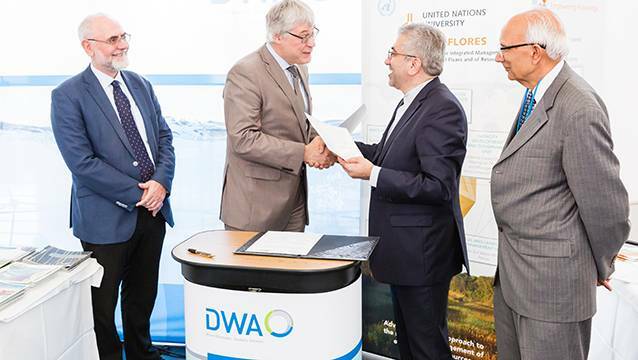 The Cooperation Agreement was signed by the Director of UNU-FLORES, Reza Ardakanian, and President Otto Schaaf and Managing Director Johannes Lohaus of DWA. The development of the legal agreement followed a visit from Mr Heidebrecht to UNU-FLORES in September 2016. The Cooperation Agreement entered into force on 16 May and is valid for a period of three years. Download the full version of the press release here.